Five Memorandums of Understanding (MoU) were signed between Sri Lankan and the Philippines on educations, tourism, agricultural and economic corporation, stated the President’s Media Division. President Maithripala Sirisena commenced a four-day state visit to the Philippines yesterday (15th) and President Rodrigo Duterte and President Sirisena held their official discussions today (16th) afternoon. They agreed to set up a joint economic council to strengthen cooperation between the 2 countries. President Sirisena met President Rodrigo Duterte at the Malacanang Place this afternoon (16th) and he was warmly welcomed by the President of the Philippines Rodrigo Duterte, stated president’s Media Division. A guard of honour was held by the armed forces of Philippines in honour of President Sirisena and young children waved Sri Lankan and Philippine national flags when President Sirisena’s motorcade travelled. Colourful, cultural events were also held. Bilateral discussion between the two leaders began after a welcoming conversation between the two heads of state. 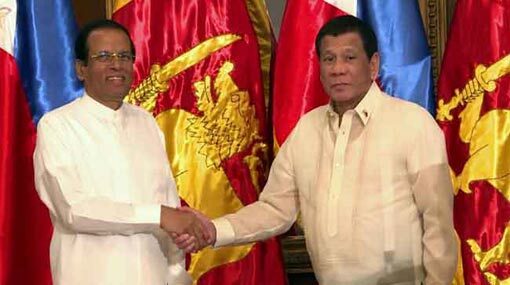 President Sirisena commenced a state visit to the Philippines, marking the first invitation extended to a Sri Lankan Head of State to undertake an official visit to their country, during the period of 58 years of diplomatic relationship between Sri Lanka and the Philippines. President Sirisena thanked the Philippine President for the invitation extended by him, while President of the Philippines said that the historic opportunity of the two countries will be marked with the visit of President Sirisena. The two leaders discussed the strengthening of relations between the two countries in a way that would benefit the two countries. President Duterte agreed to look into the possibility to establish a Philippine embassy in Colombo. The two leaders also discussed the establishment of a join Economic Council to enhance economic and trade relations between the two countries. The two countries also paid special attention to enhance the cooperation in the agricultural sector. Then the Philippine President said that he was ready to provide support to agricultural technical training field in Sri Lanka. Discussions on the importance of cooperation in the field of education and tourism between the two countries. Cooperation on disaster management was also discussed. Two heads of state discussed regarding developing the Airlines services between the countries where the Philippine President promised to send a team of Philippine representatives next march to inquire into the matter. President Sirisena stated that Sri Lanka is dedicated towards accomplishing sustainable development goals and that there is a potential for both countries to work in collaboration. The leaders discussed the importance of making a dedication for eradicating drug trafficking and drug-related crimes while the President Sirisena appreciated the contribution made by the Philippine President Rodrigo Duterte towards this issue said that the international sphere is more concerned on the matter. President Sirisena who appreciated the program conducted by the President of Philippine in eradicating drug trafficking in the region showed the importance of working together in issues regarding human trafficking and irregularities in security within the region. President Sirisena stressed the importance of working together winning all the challenges as countries of the region and described how important it is to strengthen the ties between Sri Lanka and Philippines in the future towards the wellbeing of both countries. President Sirisena further said that before the diplomatic ties shared by both countries a national hero of Philippines Dr Jose Rizal has visited Sri Lanka in the 19th century for three times which is exemplary in showing the friendship shared by the two countries. New Memorandums of Understanding (MoU) were signed after the meeting of heads of state. The new MoUs signed between Sri Lanka and Philippines regarding uplifting the educational, tourism, agricultural and educational fields while these MoUs were officially signed by the Minister of Foreign Affairs Mr Thilak Marapana and Sri Lankan Ambassador for Philippines Ms Aruni Ranaraja. Meanwhile, President Sirisena engaged in offering flowers at the commemoration plaque of the Philippine national heroes. President Sirisena offered flowers to the plaque built in Rizal Park which is the historical city park of Manilla City, Philippines. This commemoration plaque is built in memory of the national heroes of Philippines.